We offer several options for overnight boarding. Our boarding includes once-a-day feeding in the afternoon with treats given in the morning, clean, comfortable bedding, snacks & toys. If your pet has any special needs, we can do it! Whether it is giving extra TLC, preparing a personalized diet, administering medications, or giving your pet a bath before heading home, we can accommodate your pet's needs. Our indoor/outdoor runs have a climate-controlled indoor space with a doggie door that leads to a covered outdoor run. For our smaller guests, the indoor/outdoor runs are 3x6 inside with a 3x12 outside run. For our larger guests, the indoor/outdoor runs are 5x6 inside with a 5x12 outside run. We do have completely covered runs available for known escape artists. 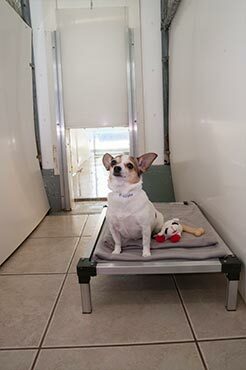 In the indoor suites our guests spend most of their day out playing with other size appropriate dogs but they have their own private suite inside to take naps, eat, and sleep overnight. Your pet must be very social in order to board in this area. The building is climate controlled. 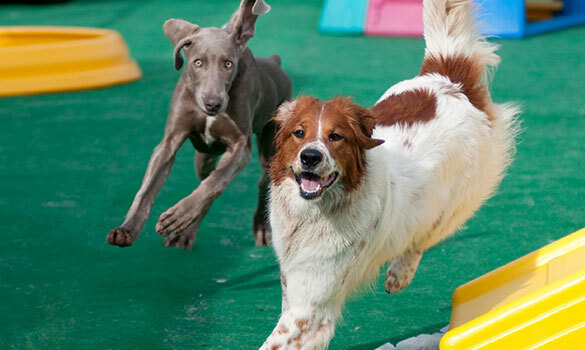 This boarding option is the only option that includes playtime in the boarding price. The arena suites are located in an enclosed climate controlled building. A daily activity is required in this boarding area. In addition to this, the pets are taken out for potty breaks throughout the day. Our back bungalows are outdoor covered runs, protected on three sides, and are well sheltered from the weather. 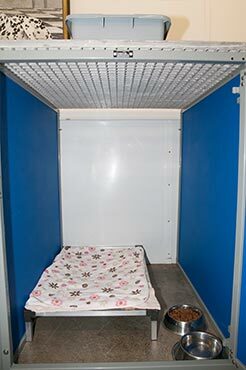 These runs are 10x15 and this is the largest size kennel that we offer. In this boarding area, pets do not have access to a heated area. 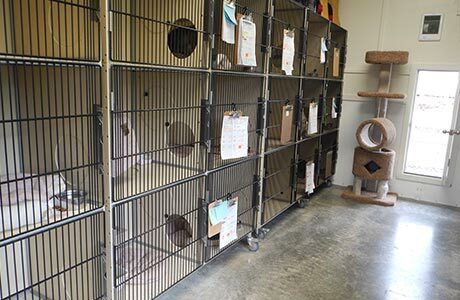 Our feline friends enjoy a separate room from all other pets. 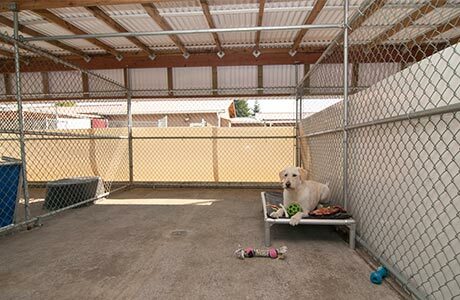 They get to spend time out of their kennel and have access to a completely enclosed outside area. We can also accommodate other types of pets - just ask! Monthly rates are available. A month-long stay is considered 28 days or longer with us. The monthly rate includes free twice-a-day playtime, free twice-a-day feedings, medications given, a free bath at the end of the stay, and a 20% discount. Ask about our Customer Loyalty Program! Minimum charge for a 1 night stay is $40.00. We have a 5 day minimum over most major holidays. These holidays include: Memorial Day, Fourth of July, Thanksgiving, and Christmas. 10% discount for Military, Police/Fire, and Seniors. 10% discount for bills over $400, 20% discount for bills over $700. $16/day additional charge for geriatric, special needs, or aggressive pets. Please see the FAQ page for descriptions.